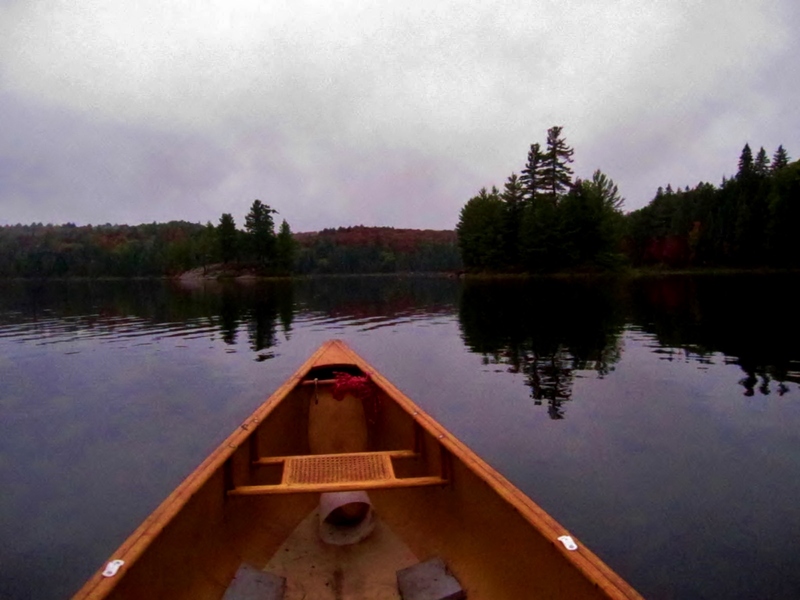 The morning paddle that drew me from my perch at dawn, down into those dark glassy waters of the lake, was like a prayer. The islands, with their cluster of pines, like monks at matins, ushered me with their silent vigil into the sacred space beyond. 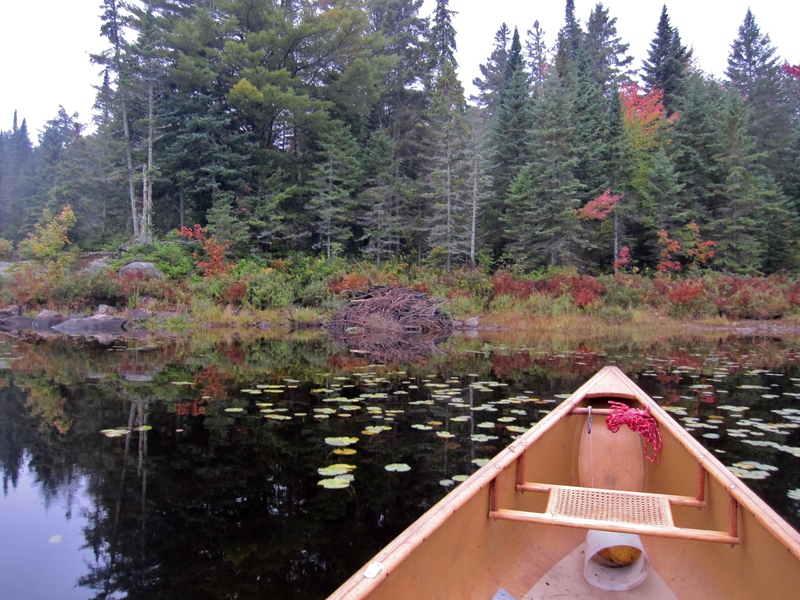 A loon bobbed up next to the canoe and accompanied for several paddle strokes. 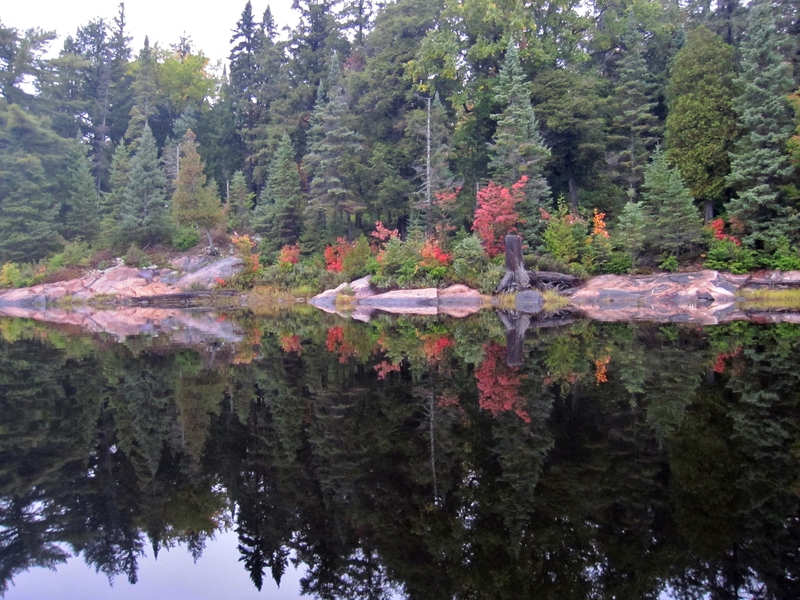 In the cove itself, rocks and leaves in chromatic array, reflected the morning light and were mirrored back in the still, smooth surface of the resting water. In beauty we walk… paddle, swim, crawl and fly…. and beauty was filling my body, my heart, my voice til it virtually burst into song. If I were to describe those wee hours now, from this vantage point in the day, I would perhaps say it was the calm before the storm, or perhaps the rest between labor pains. A noreaster storm is upon us, we think, with heavy rains and powerful winds. We have been driven to our tents. Seven hours ago, over a breakfast of eggs and polenta, I shared with my friends the experience of the star-littered pre-dawn sky. They could scarcely believe that the sky could possibly have cleared since it seemed to them to have rained perpetually all through the night. 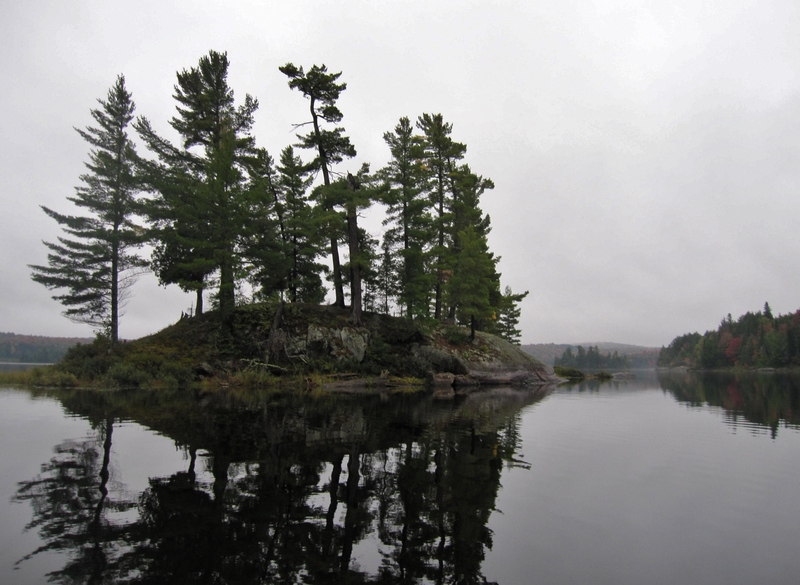 We were just considering an exploratory day trip on the lake’s quiet water, when the wind, which we had noticed had shifted directions but had hoped was a clearing one, began to pile up the clouds which were now rolling and roiling in from the east. Six hours ago the rains began in earnest. We managed to tie down camp as best we could, moving the tarp once, when the place we had first pitched it filled up like a pool, then huddling beneath it for a standing lunch around the food barrel. Conversation waned sorely, along with spirits. We were in need of a good storyteller…. or at least an early afternoon happy hour. We have been in our tents now for 2 hours, since the conditions became too harsh to remain ‘outdoors’. Our tent is holding for now, though it has been quite an experience. It has been awe-inspiring to witness this little tent stagger and hold fast as the winds and rain have buffeted and pummeled it. I am thankful, so thankful for shelter. Marti and Dennis’ tent is leaking. I pray they are dry…enough. I am part of this wildness too…. and I am not. I realize on some level the storm has no real concern for me, no awareness of me that I can believe in. It is bigger than me. I am so small a part of the whole, it is hard in this moment to believe I am integral. I have asked for whoever, whatever souls accompany me, to watch over us. And perhaps now is not the time to wax philosophical, but I trust the earth still. This too shall pass and we are not in control. The storm ended as crazily as it had been, with the sun peeking through clouds just long enough to gift a low rainbow, even as it continued to rain, the wind eventually whipping some snow flurries into the mix. I exited the tent and bolted out for a look, amazement, excitement, electricity and awe filling me with unexplainable energy and joy. 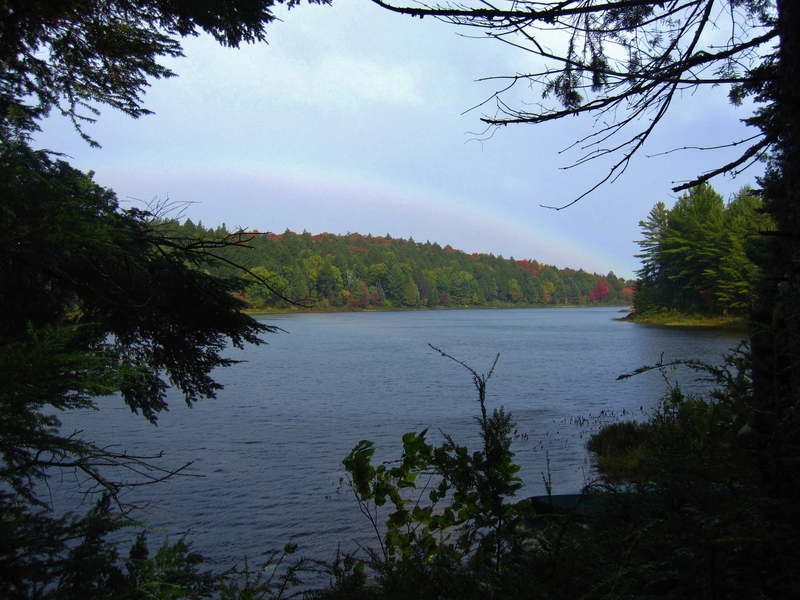 I practically danced as I swirled round the camp, from lakeshore to tents, reporting the beauty I beheld, spinning to take in the sight of fat raindrops falling through shafts of fleetfooted sunlight as it flashed through the trees. My friends didn’t quite share in my exuberance. I fear they find it to be naïve. Perhaps I am a fool, after all, but not in the way that they think. No, not in the way that they think at all. I needed to move, to expend and express and escape. I needed to be out in the water, in touch with its energy, its mystery, its depths… and its peace. To let the paddle thrill me, soothe me, still me, release me. Eventually, the late afternoon calmed enough that my husband and I were able to take the canoe out for a spin, exploring the cove I had relished this morning, then paddling east, staying close to the south shoreline to stay out of the big water and the waves that still bore the potent energy of the storm. We paddled to where the lake turned into a river. I am concerned for my friends. They are feeling so vulnerable, afraid. I wish I could reassure them, but today’s deluge has only heightened their anxiety about paddling the Petawawa river with the increase in water levels. I still believe it will be paddle-able. Is it instinct, optimism or preparation? Is it naivete or wisdom? I cannot say. I only wish I could recall more of the details from the trip reports I’d poured over when planning our route. Still, I doubt even this would ease the fears of my friends. Perhaps their experience is wiser than my foolishness, and perhaps my joy in the face of adversity does not lend confidence. But I know that we will get through tomorrow, whatever it brings. Upon returning home and transcribing this page, I am in wonderment that the wind came from the east that day, bringing its gifts, for as I continue to work through my book, I am struck by the placement in the east of the human psyche of the Sacred Fool . (I did not have these particular pages with me in Algonquin) The Sacred Fool is also known as innocent sage, and as trickster. S/he is that facet of our psyches that offers a perspective from either innocence or wisdom that ‘lightens’ us up (as the sun does in the east) ‘S/he is both innocent and wise, both joyous and serene, both goofy and insightful. The innocent is the Buddhist’s ‘beginner’s mind’, that allows us to see with fresh eyes, with a young heart, to dance as if no one is watching. The sage, with his/her perspective from the mountain and wide-angle awareness, invites us to let go of the small story in which we are trapped and consider what is of true and lasting value. S/he possesses the perspective of ‘all is well’. The sage in each one of us simply ‘admires nature’s way’. Ahh, the answer to my question. Vicki, I hadn’t noticed there was a part 2 to Day 7 when I asked my question about your predawn paddle. Thank you so much for sharing this exploratory trip from Canada. You have drawn my interest to Bill Plotkin’s book. I instantly smiled broadly and laughed when you offered up the direction of South and our indigenous self. The sacred fool felt familiar as well.